And I like having my favourite books on my book shelf. Concidering the appartment prices in Munich it might be a good idea to safe some shelf space. The eReader also feels very well in my hand with this special coted case. But I like flipping through the pages of a book. It’s a lightweight with just 185g Gramm, smaller than a pocket book (165mm x 114mm) and fits into every hand bag. How heavy are pocket books – 350g for an average one? Ok, I don’t have the handbag problem. You can take thousands of books with you on holiday and not have the weight and space problem with your luggage. But it’s probably more attractive to be stolen than a pocket book and then you’ll lose 150 Euro + eBook costs. But an E-Ink screen is really different than a computer screen. Your eyes don’t hurt at all. Also: I stare at a screen all day long anyway. Well, I don’t have to re-charge books which is handy when you are trekking or sailing. That’s true, but eReader batteries last up to a month now – that’s longer than your holidays anyway ;o) I simply can’t imagine if that’s the right reading feeling for me. We’ll there is only one way to find out – try it! Conclusion: We think there is only one way to find out if you’re ready for eReaders – simply try it. 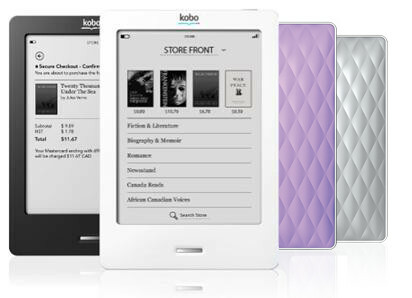 We will definitely do so with our Kobo eReader Touch and are looking forward to all the other new gadgets the industry has for us at IFA. Changes in Social Media Behavior Present Opportunities for Fresh Content Barcelona, Lisbon and next year Paris – Does Measurement Travel?